If you are brainstorming ideas for outdoor lessons, a great place to start would be one of nature’s oldest mainstays — trees! Being our primary source of life sustaining compounds and materials, trees are pivotal to our existence on Earth. 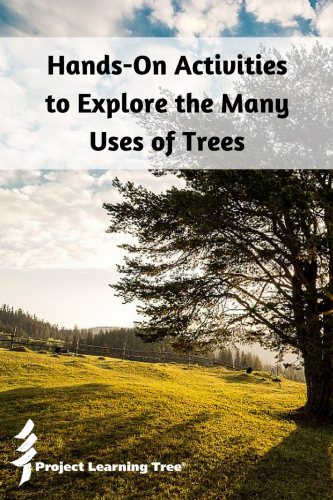 You can impress upon your students the importance of trees by studying them and exploring some of their uses. And the beauty is, you can easily move this learning experience out into the sunshine and fresh air! Let’s look at some fun and engaging activities that explore the uses for living trees, that lend themselves to spending time outside of four walls. Cast your mind back to when you were a child. Perhaps one of your more memorable pastimes was building and playing in a treehouse. Whether they build it in the backyard or a secret forest location, kids love designing and building their own treehouses. Why not turn that into a learning experience at home or at school? Some students enjoy designing their treehouse on programs such as SketchUp or simply drawing them by hand. Others like to build a model of their treehouse, using old or recycled craft materials. Older kids may like to add dimensions to their design and create a floor plan for a real livable treehouse; especially one that incorporates sustainable and environmentally-friendly design features. Either way, exploring school grounds or a local park can help inspire your students’ imaginations for their own treehouse design. For more ideas, see Activity # 37 Reduce, Reuse, Recycle in PLT’s PreK-8 Environmental Education Activity Guide. First, take your students on a walk through a local park or the school grounds. Look out for natural bird houses or potential bird house locations. Focus their attention on how trees provide the structural support and protection that birds need to build a home. Then, transition into a bird house design and building activity. Encourage your students to give some thought to the challenges facing birds when they construct their own places to live. For example, students will need to take into consideration how birds will enter and exit the birdhouse, what materials are best to use and why, and how to hang their bird houses from the tree itself. Use one of these ideas for building a bird house, or design your own activity. For more ideas, see Activity # 22 Trees As Habitats in PLT’s PreK-8 Environmental Education Activity Guide. Of course, trees provide shelter for a wide range of different species. The above activities are an excellent segue into investigating and researching animal habitats. Dioramas are a great project idea because they allow students to not only research their habitat of choice, but also recreate its features. For more ideas, see Activity # 23 The Fallen Log in PLT’s PreK-8 Environmental Education Activity Guide. Download a free sample activity from PLT’s new e-unit for grades K-2: Treemendous Science! Trees are used as wind breaks in agriculture, for example, to protect crops. Students will love making their own models of trees and trying to improve their wind breaking characteristics. Use any material you have available to construct models of trees such wooden craft sticks and buttons, with modelling clay or hot glue to hold it all together. Have students test the wind breaking capabilities of their trees using a pedestal or table top fan as a source of moving air. To measure the effectiveness, tie ribbons to both the pedestal fan and to the tree sculpture. Measure the speed of the wind at the fan relative to the speed at the tree sculpture by observing the relative movement of the ribbons. Use this activity as a basis to research or discuss why wind breaks are used, particularly in agriculture. You may also like to discuss what features of trees make them an effective element of a wind breaking system. For more ideas, see Activity # 50 400-Acre Wood in PLT’s PreK-8 Environmental Education Activity Guide. Kids love engineering things that make a sound and they’ll love designing and building their own set of wind chimes. There is a lot of potential for creativity with this activity. Students can use a whole range of materials, including recycled materials. You can use different sizes and shapes to get a range of different sounds. And trees provide the perfect structure to hang them off! There is a lot of opportunity for cross-curricular learning too. Science teachers may like to talk about how roots anchor trees to the ground in windy conditions. Geographers may wish to discuss the importance of wind in distributing vegetation, or wind as it pertains to weather and climate. Music teachers can discuss how the different sounds are made and the musical attributes of their creations. There are many wind chime designs students can choose from. And, making numerous sets of wind chimes out of different materials can help students observe sounds from the various materials. For more ideas, see Activity # 4 Sounds Around in PLT’s PreK-8 Environmental Education Activity Guide. Who doesn’t love pulling up in a shady spot on a hot summer’s day with an ice-cold drink in hand? Indeed, trees provide shade for a range of different creatures! If you set up under the shade of a big tree to learn with your students, why not do a lesson on shade itself? A great activity to educate your students about the cooling effect of shade is to measure the temperature difference between shaded and non-shaded areas. The general gist of this activity is to put thermometers in areas of direct sunlight and in the shade of trees and measure the temperatures in both locations. You can find more detailed instructions here. You can increase this activity’s degree of difficulty by incorporating graphing exercises. If your science department has some light sensing and data logging equipment, this could be used to compare light levels and temperature, and the relationship between these variables. For more ideas, see Activity # 42 Sunlight and Shades of Green in PLT’s PreK-8 Environmental Education Activity Guide. As we know, trees are the lungs of the Earth; absorbing carbon dioxide and emitting life sustaining oxygen by way of photosynthesis. Depending on the grade level of your students, there are numerous activities and experiments that they can do to investigate how trees purify the air. A simple, hands-on, end-of-lesson experiment for the younger kids can be found here. In this activity, students submerge large leaves under water and observe the bubbles of oxygen that form on the surface of the leaf over time. For the older kids, you may like to work on a more elaborate setup in the lab and investigate the different factors affecting photosynthesis. You can find suggestions for practical lessons here and here. There is also potential for some mathematical exercises regarding the gas exchange capacities of trees. For example, given that trees are able to absorb as much as 48 pounds of carbon dioxide per year, students may wish to estimate the carbon adsorption potential of their school grounds, or a famous forest such as the Amazon. For more ideas, see Activity # 72 Air We Breathe in PLT’s PreK-8 Environmental Education Activity Guide. Trees are a source of many foods such as pears, almonds, and coconuts. There are many interesting research projects that older students could do related to nutrition. For example, they could research a particular food that comes from trees, and investigate what mineral, vitamin or trace element it is particularly rich in. In this experiment, students determine and compare the vitamin C levels of different fruits, fruit juices or varieties of the same fruit. This activity is a terrific way to introduce the topic of nutrition. For younger kids, cooking-based exercises are also a wonderful way to introduce nutrition and the importance of eating healthy. You can find some fruit-based cooking activities and recipes here. And students can also practice counting and fractions as you measure out different quantities. A lesson, field trip or research task centered on any nutritious natural food source would be beneficial. It really depends on what is available in your area. For more ideas, see Activity # 16 Pass the Plants, Please in PLT’s PreK-8 Environmental Education Activity Guide. For thousands of years, cultures from around the world have obtained dyes and pigments from natural materials. They used these natural dyes and pigments in art, crafts, cosmetics and fabric dyeing. Natural dyes were extracted from bark, leaves and flowers. This makes for a great history, art or science lesson and can be followed up with a number of different activities. For example, students can make dyes from leftover fruits and vegetables, and these dyes can be used in making watercolor art or to dye fabrics. You can find a more detailed dye extraction procedure here. Spinach and beet juice make great dyes. Red cabbage also makes a vibrant blue-purple dye solution. People have also been using fibers obtained from trees and plants for thousands of years to make clothing, textiles, rope and paper. Stinging nettle fibers, for example, are incredibly useful, and you can extract them quite easily. For more ideas, see Activity # 15 A Few of My Favorite Things in PLT’s PreK-8 Environmental Education Activity Guide. Due to their large root systems, trees can reduce wind and water erosion. They also act as filtration systems, removing larger objects and particulate matter. Students can learn how plants act as water filters through a hands-on experiment. If you have a large class of students, you could assign groups to measure the filtration abilities of different seedling types, and then compare them at the end by visual inspection of the filtrate. Use this experiment as a basis to discuss and investigate erosion and the real-world applications of the science. For example, certain species of trees and shrubs are used in erosion management schemes in national parks or on farms. For more ideas, see Activity # 70 Soil Stories in PLT’s PreK-8 Environmental Education Activity Guide. This one is probably best left to the older students, but they will find investigating the medicinal uses of trees and plants through the ages fascinating; especially the social issues that inherently accompany these uses. Students may also like to map out the areas where these natural medicines can be found and how that has influenced their distribution. These topics also make for absorbing presentations and ethical debates. For more ideas, see Activity # 13 We All Need Trees in PLT’s PreK-8 Environmental Education Activity Guide. Do you have any other suggestions for activities that explore the many and diverse uses for trees? We’d love to hear them! These experiments, games, and activities can help students in grades K-8 learn about the effect pollution has on the environment and inspire us to make a change. Why do some organisms live in many environments while others are only found in very unique places? These STEM activities teach students about species diversity.